Entry Gates are Gate 3 & Gate 5 both are located on Shore Drive (Route 60). 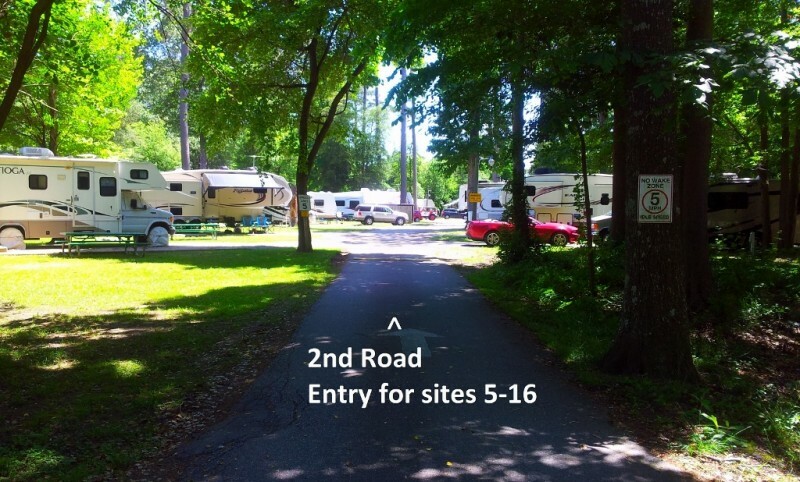 Base authorities “prefer” that RVers use commercial entry at Gate 3 (next to campgrounds), starting June 01, 2016 Gate 3 will be open 24/7! When necessary use Gate 5 starting June 01, 2016 open M-F 0500-2130 hrs. Sat. 0700-2130 hrs. Sun. & Holidays 0700-2000 hrs. Be advised high traffic conditions and backups may be encountered at Gate 5. ---- From I-64: 1. Take US-13 (Northhampton Blvd, exit 282) east 2. Turn left on Diamond Springs Rd. then follow to the end 3. Turn right on Shore Drive then drive east 1 mile 4. 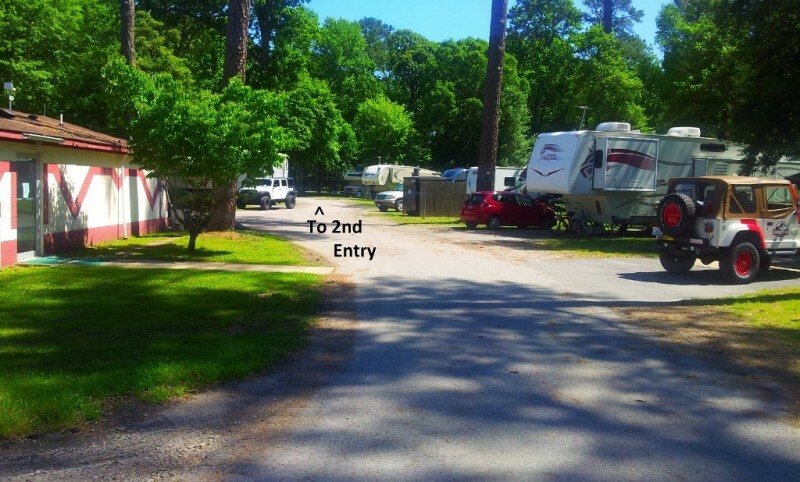 Turn left into Gate 3 (it is open 24/7 and is next to campgrounds)on Helicopter Rd “if necessary” continue on Shore Drive for another mile you will pass Gate 4 (Shut Down) turn left into Gate 5 on Independence Blvd. open M-F 0500-2130 hrs. Sat. 0700-2130 hrs. Sun. & Holidays 0700-2000 hrs. 5. -For Gate 3… When entering gate 3 (Helicopter Rd) bear to the right and use the commercial entrance, inspections are not required so you may continue through parking lot to gate guard. 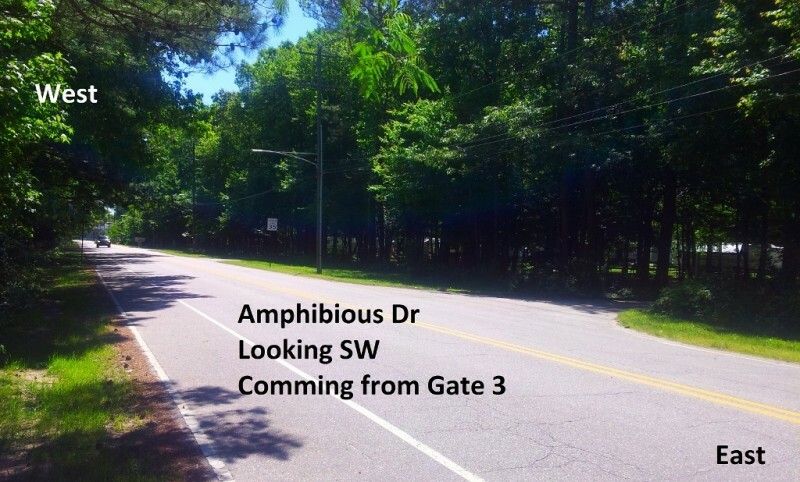 After entering through Gate 3, turn right at the light onto Amphibious Dr (heading east). 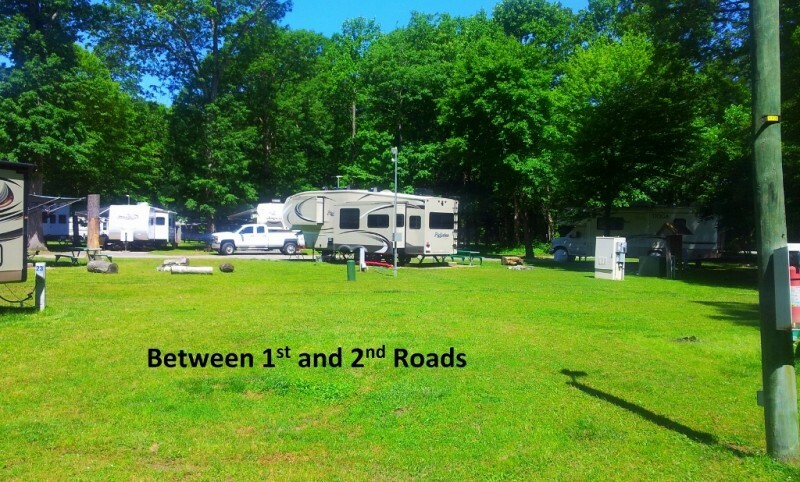 The campground is on the right… or -For Gate 5 after passing through the gate turn left (heading west) on Amphibious Dr in 0,6 miles campgrounds is on the left. ---- From I-264: 1. Take Independence Blvd (exit 17) North 2. Independence Blvd will take you directly into Gate 5 open M-F 0500-2130 hrs. Sat. 0700-2130 hrs. Sun. & Holidays 0700-2000 hrs. 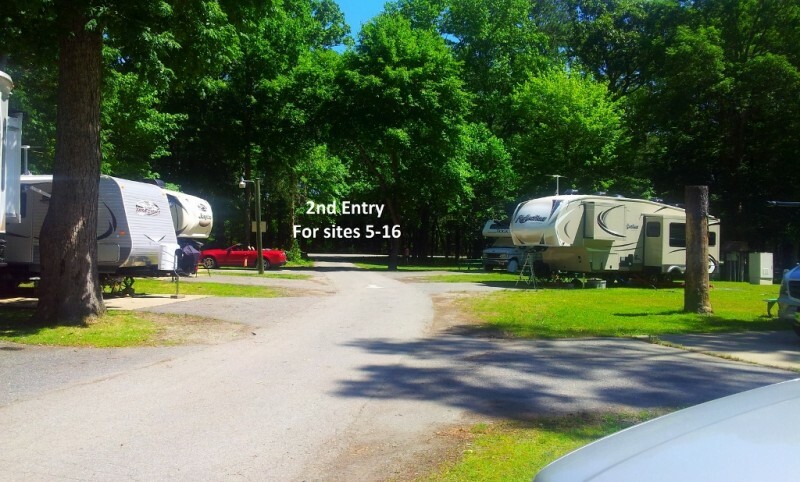 “HOWEVER” RVers are asked to use Gate 3 open 24/7 so turn left (west) on Shore Drive (Route 60) before gate and drive 1 mile to Gate 3 open 24/7 on Helicopter Rd you will pass Gate 4 (Shut Down) campgrounds are right beside gate 3. When entering gate 3 (Helicopter Rd) bear to the right and use the commercial entrance, inspections are not required so you may continue through parking lot to gate guard. 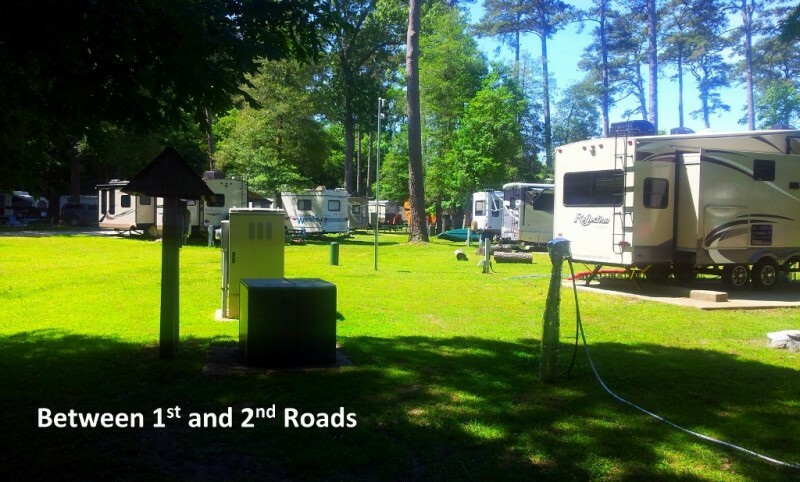 After passing through gate turn right at the light (Amphibious Dr) the campground is on the right. 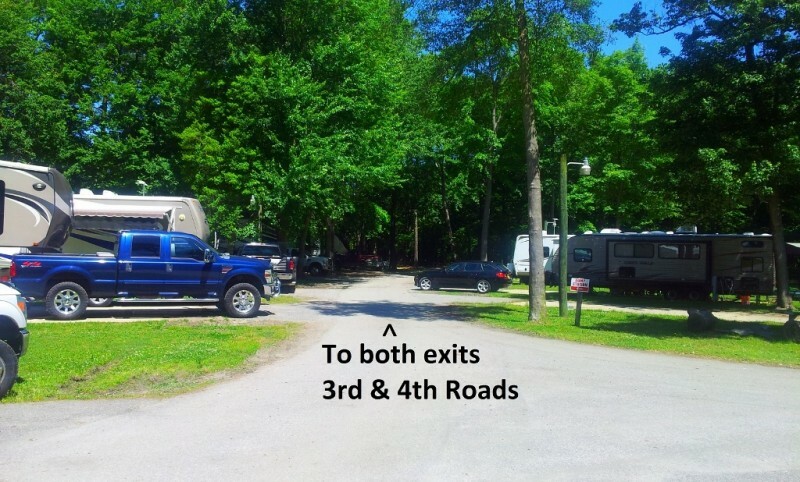 ---- The campground has two entrances and two exits the explanation below is left (east) to right (west) when facing the campgrounds, when coming from Gate 3 the last two roads (1st & 2nd below) are entrances… 1st Rd is entrance only it is the main entry and will take you to the office (office is located at far end of campgrounds) and all sites except 5-16. 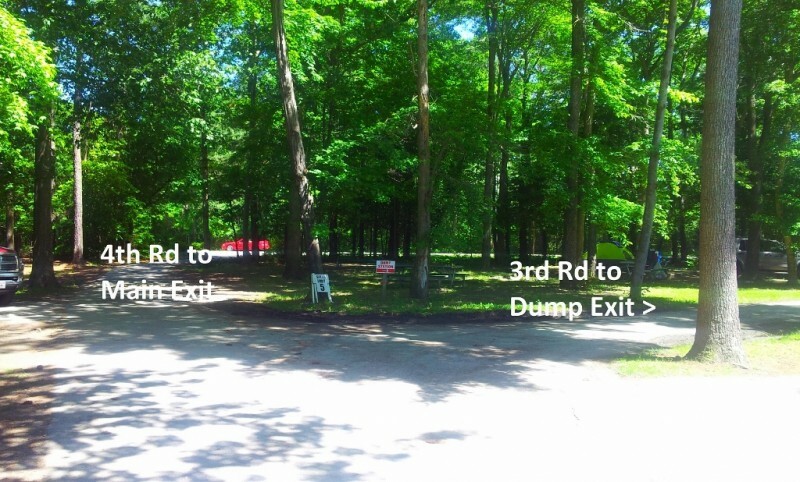 2nd Rd is entrance only it takes you to sites 5-16 the office is a short walk, “if you know your site number.” 3rd Rd is exit only for Dump Station users. 4th Rd is exit only this is the main exit. ---- Note: All roads are one way! In order to park on sites 5-16 you will need to enter on 2nd Rd, the office is a short walk. 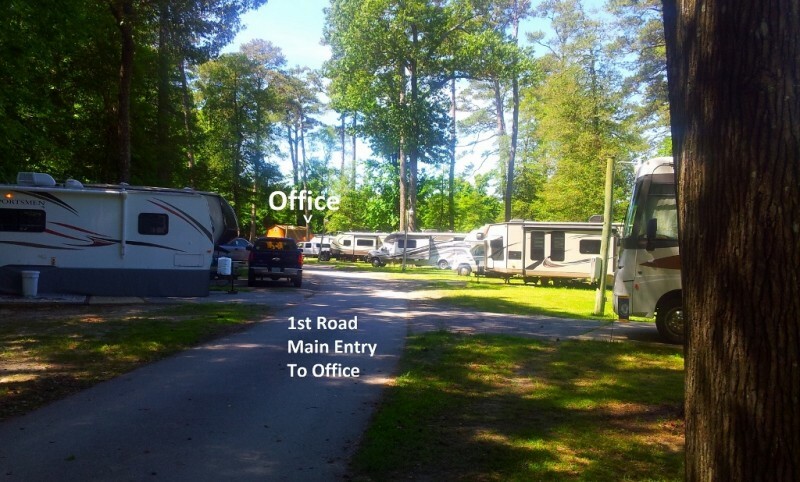 If you do not know your site number and need to go to office first no problem, if you are assigned to a site number from 5-16 then after office visit simply exit campgrounds on 4th Rd and reenter on 2nd Rd. Reservations can be made up to 6 months in advance. 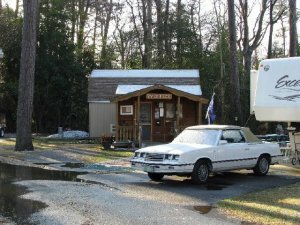 UPS/FedEx/DHL ONLY - Naval Amphibious Base Little Creek Campground, Space #, Norfolk, VA 23521. ---- For USPS, you must use local General Delivery - NOT this address. Small pets allowed with usual leash and clean-up rules. Not allowed in playground. 30 day stay limit, then 2 weeks out. 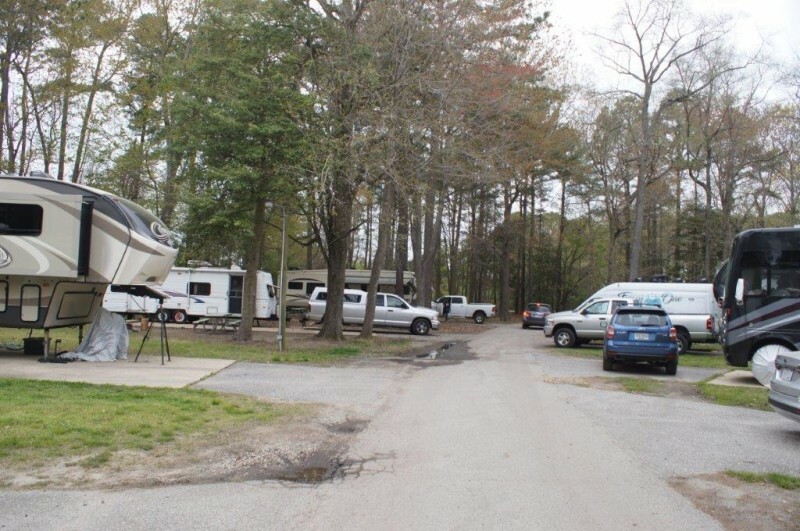 The campground at Little Creek are equipped with 45 RV sites complete with power, sewer hookup, cable television hookup and water hookups, picnic tables and grills. 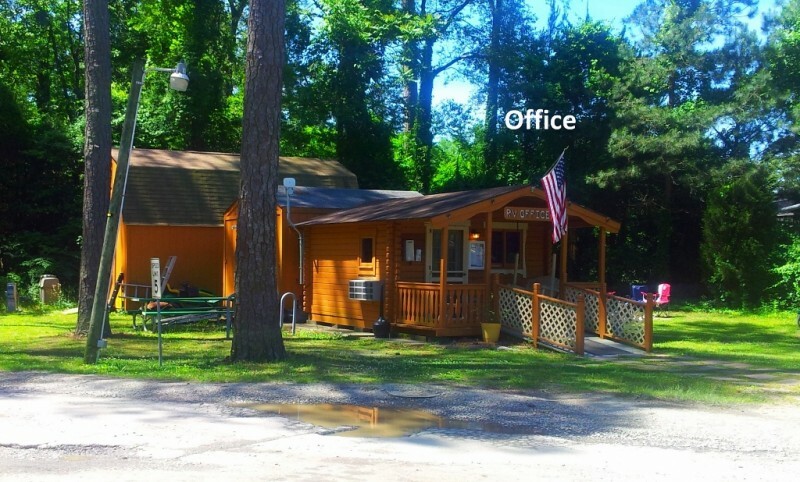 A public restroom is on site with shower and laundry facilities, and a picnic pavilion. Pay phone and change machine, soft drink machine and a newspaper stand are also available. 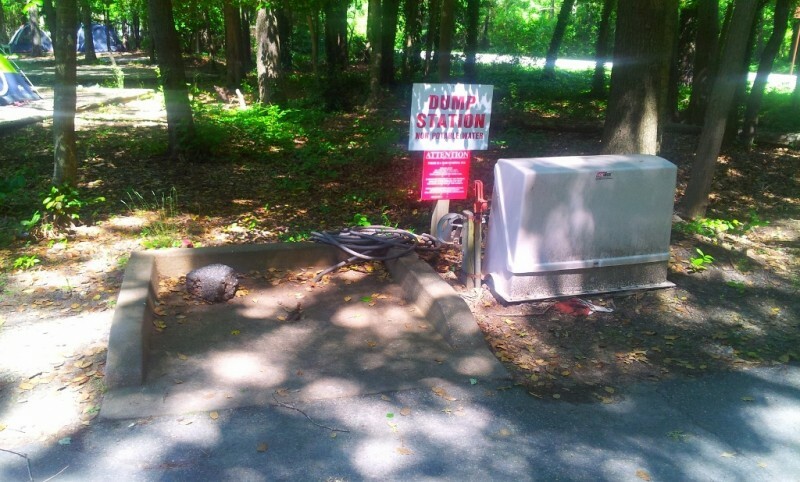 There is also a dump station for non-residents as well as concrete pads and six tent sites for dry camping. We used Gate 3 that is preferred. However, there are two openings. We came in from the road in the right side but stayed back hoping the gate guard would open that side for us. He let 5 or 6 cars come through without acknowledging us so my husband decided he wanted us to come through the left opening but our travel trailer stairs (folded up) scraped the concrete barrier and we had to back out. We also got a ticket for "wreckless driving". I would suggest you wait and have someone get out and ask to use the other opening. We eventually got into the site and the Camp Host came over and was very helpful. It is shared water with another site. There was free laundry but it said to use Pods only. The roads are narrow and we had to watch where people were parked on our way out. Good size Commissary and two story Exchange. First let me say that it rained both days we were there, we were on our way home, and we had been down in the keys so it really wasn't fair. 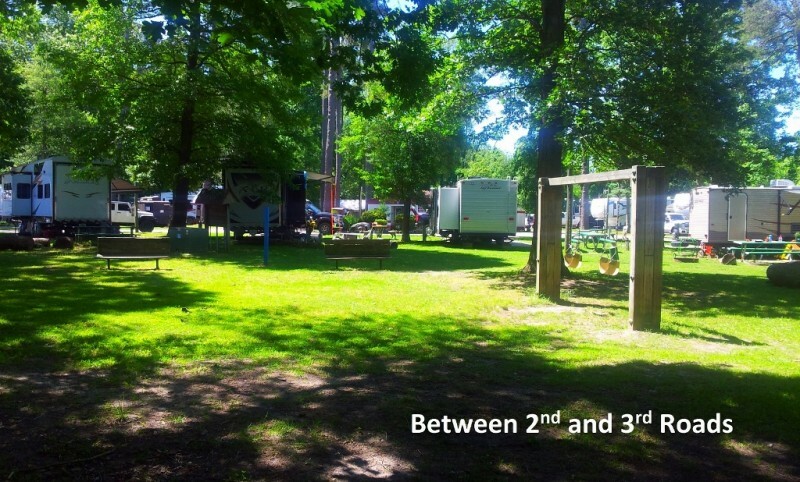 The campgrounds are very close, not much room between sites. Like I said it rained and our site was mostly under water except for the pad that we drove in on, we needed our boots to hook up everything. There was no one available to show us to our site even though it was in the middle of the afternoon, no big deal we had our site number and some driving around and we found. Laundry room was across from our site and could definitely use an overhaul, dryers sort of worked and the place really need cleaned up. I'm not saying the place was terrible but with all the other options available I doubt we will be back here. 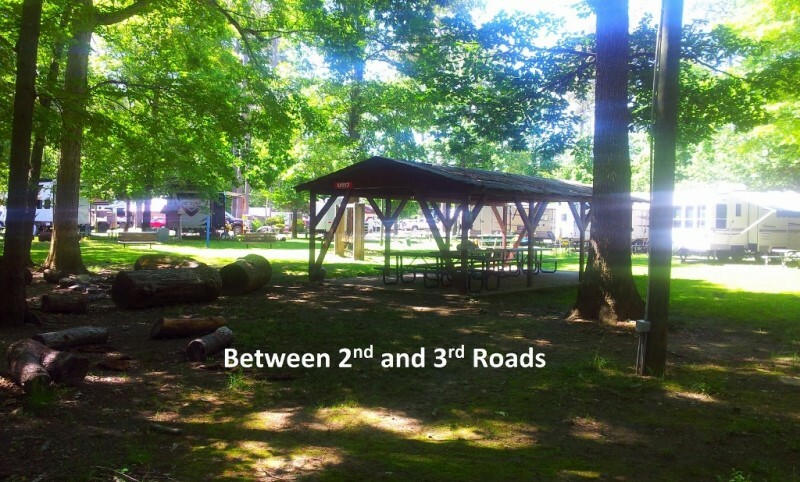 We recommend this campground and the area. Most of the sites are pretty close together. Personal do a good job and are very helpful. Surrounding area is also clean and well maintained. Nice campgrounds but could use a little restoration. Noise is tolerable, mostly road noise (passing vehicles outside gate). The area has everything to offer (but seclusion/isolation) and at reasonable prices. Off base traffic can be a problem so chose the right times to get to where you are going. Highly recommend the military beaches on both JEB Little Creek & Ft. Story, quiet and not crowded. Nice laundry and free but washers and dryers were “full” of black dog hair; perhaps a temporary problem. Recommend both Bubba’s Seafood & Dockside Seafood Restaurants, they are beside each other located between JEB Little Creek & Ft. Story on the south side of route 60 (Shore Drive) beside the John A Lesner Bridge address: 3311 & 3323 Shore Dr. Virginia Beach, VA 23451 (from 60 turn south on Vista Circle and you will see them). 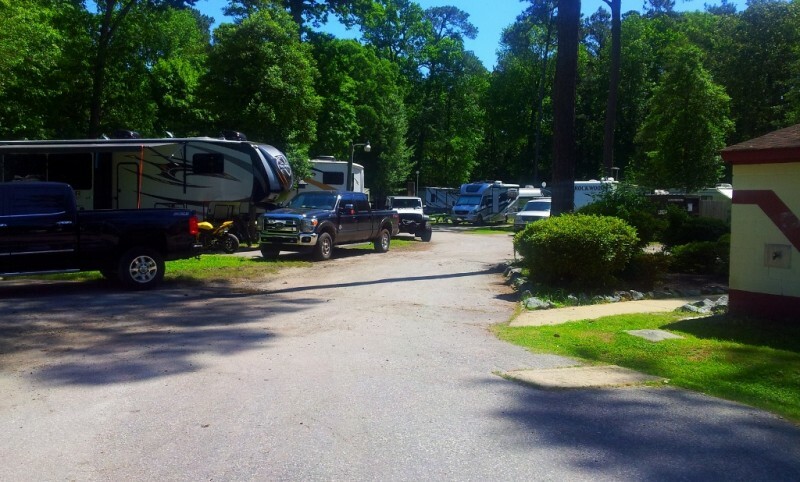 We sent Larry (U.S. Military Campgrounds and RV Parks) an update also including pictures and a video that is now posted; we hope you all find them helpful. We are very thankful for what Larry is doing here and will continue to support his efforts in every way we can. We wish all of you safe travels! It's nothing fancy, but everyone was nice, everything worked and we had a great time. We stopped for an overnight on our way south this year. We found a spot large enough to not unhook the trailer from the truck and just dropped the stabilizers and made utility hook ups. The sites are OK and the facility is clean, but it still could use a little dressing up. No issues or problems though. Nice size BX and Commissary, Mini-BX had competitively priced gas, it was over all good place to stop on our way out. 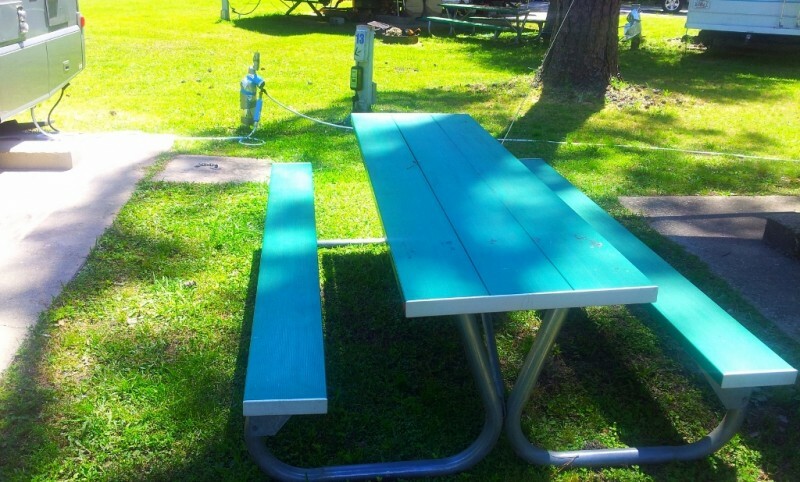 What can be added about a 30+ year old CG but to mention that they now have two new washers and driers free of charge, and as already been mentioned many times Destiny as well as the camp host are great at doing their jobs. A little more money reinvested in this facility could go a long way to updating it. The free wifi works as well. 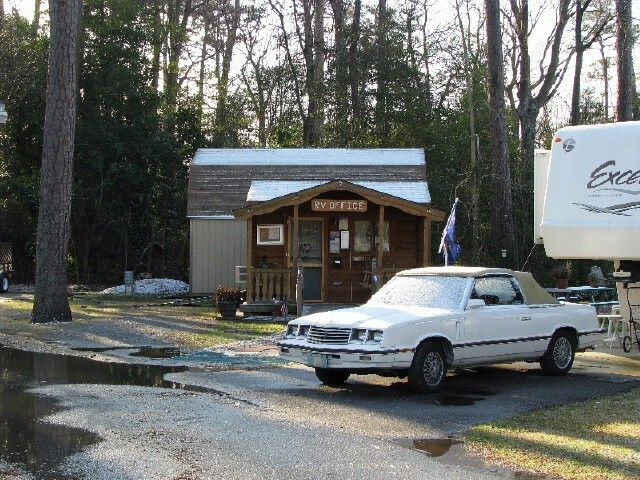 I've stayed at this campground a couple of different times. Like the others have stated, Destiny in the office is great. The showers were good, didn't use the laundry facilities as I used to live in this area and was here to visit friends. The roads need repaving as there are some big holes. They also need signs at the entrances to indicate which are incoming and which are outgoing. 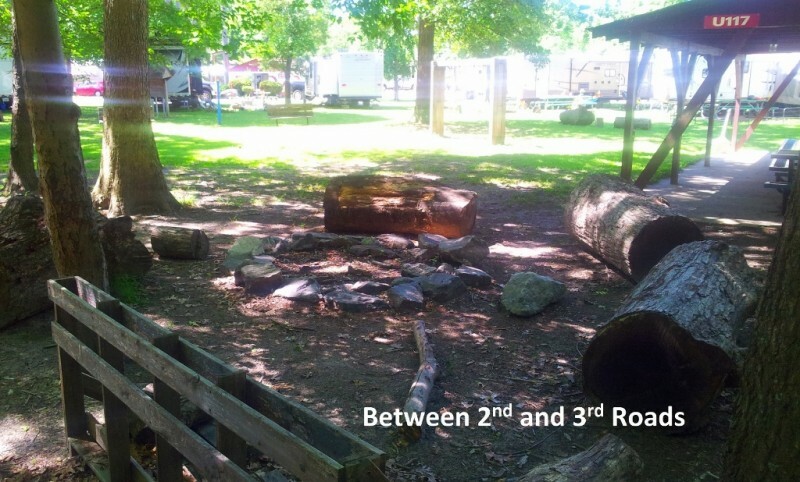 They did put some big logs in each site for a fire ring, which was nice. Lots of rain, so most of the wood (free) was wet, but managed to find some in the woods that wasn't too bad. Destiny got me in for this fall even tho the Navy reservation system said they were full. We shall see when I get there 1 Sept. For me, location and price are the biggest plus. I camp here in a 27' motorhome with toad. Great Location. Campsites are tight but level. Parking is limited. 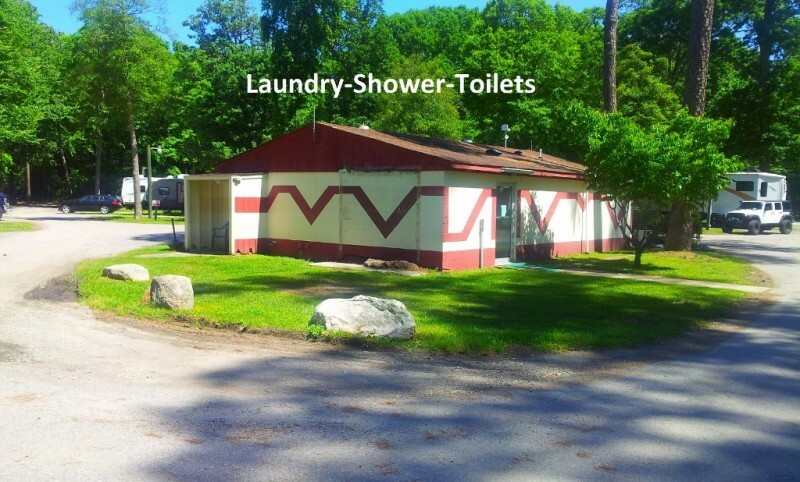 Laundry facilities and bath house are wornout and need a facelift, new paint, some attention. Roads are OK except when it rains or snows. 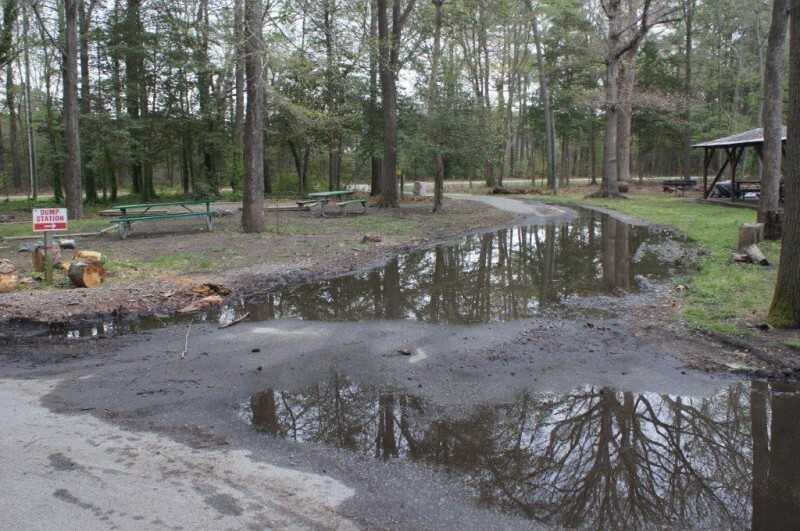 Then there are lots of big puddles around key areas like the office and dumpster -- the most heavily used areas. Very disappointed in the senior leadership who was unwillling and / unable to fix big holes, pot hole in the roads near the office. Facilities maintenance and the MWR office both came out and scratched their head and nothing was done. Pointed fingers at each other and said 'its their job' or 'we have no money'. 5 inches of snow twice this past Jan - Feb and no, nada road clearing. You are on your own. Lip service but no service. The Office Manager/Destiny and both the Camp Hosts / David and Jenn, could not have been nicer and more helpful. Real friendly, helpful. The bright spots in the whole stay. Just wish the senior leadership would get it together. It could be a very nice campground if they gave it some attention. Destiny was great and very accommodating to me numerous times because I had short notice site renewal dates but she was able to keep me at the campground. The camp hosts were great and had wonderful times meeting other guests and enjoying great hospitality. I do wish there were a few more washers and dryers and a few more 50 Amp sites. Liked very much the concrete and level sites. 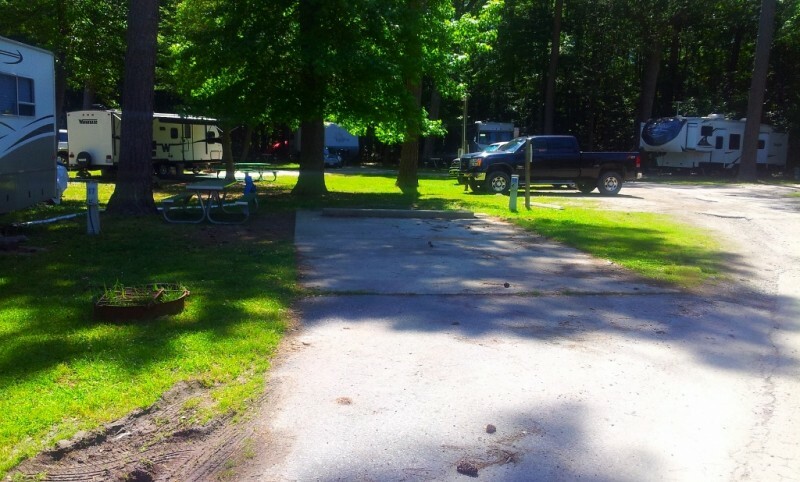 The campground was well maintained. I hope to be able to spend some time there again. R.G. 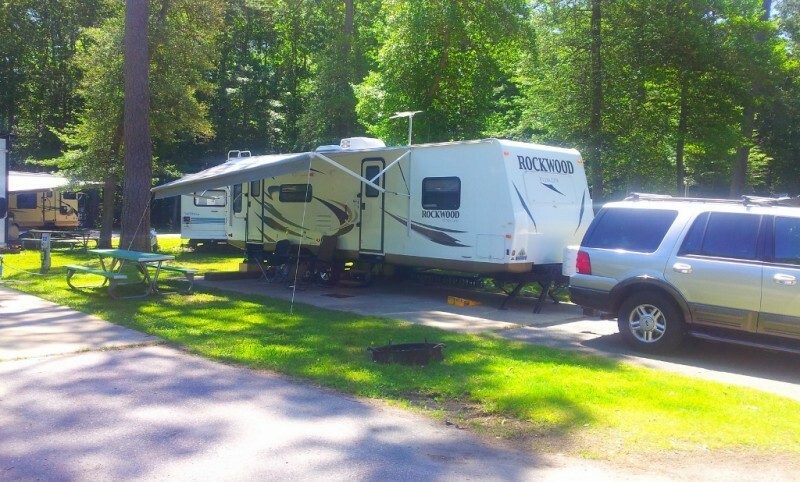 left this review using the Directory software: - Full timers bragging that they have been in the campground for over a year. Wonderful camphosts. Destiny was wonderful, very friendly and helpful. I stayed 3 nights. Destiny handled all sign-in details with ease. She was great and acted like we had been friends for a long time. She was very accommodating about my day to day stay and kept me informed by phone, particularly about a future reservation. Site occupants nearby were helpful and friendly. The pads were concrete and level. Shower house was always clean. A great place to stay!!! This campground is pretty Cool, super dog friendly with multiple access to trails. It's just a few minutes to the the beach, base pool, base theater, bowling alley, commissary/Nex and medical. The campground manager Destiny is wonderful. The camp hosts were great, old host leaving new host taking over. 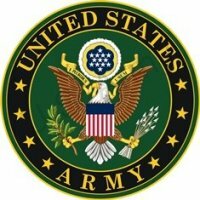 Lots of help and great info. Being shared by a everyone, doesn't get better than that! Oh wait!! Yes it does during the day it is wonderful!! Kids playing running from camp to camp, early evening campfires. Everyone mingling from camp to camp. Then the sun goes down and the drunks come out. A few young people getting kinda rowdy then the name calling. Turns out its sisters. Very obnoxious behavior, one young woman calling her mother horrifying names. To our shock it was one of the camp hosts daughters. We stayed for about a week. Very close to the couple of gathering areas in the evening. We had to listen to the drama and that followed the fighting. It really made it hard to enjoy the great campground. I felt so bad for the host. She is such a nice lady and so willing to help. To be treated like that in front of other campers. To much drama and BS! I changed my dates a couple different times and the campground manager Destiny was great and very accommodating. There could be more washers and dryers and a better playground. Destiny informed us that there were camp host to assist us for the hours she was not there and I don't believe I ever met them, just their children. The packet that I received with information was great and we will return back to this campground. Highly recommend using the Commercial entrance at Gate 3 with large RV's. 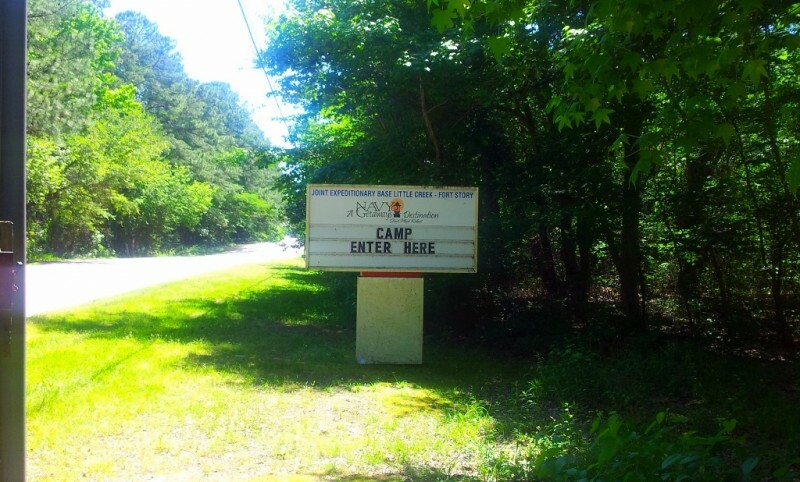 We met with the current camp host Destiny Newman/757-462-7282. It is now Joint Expeditionary Base Little Creek-Fort Story. 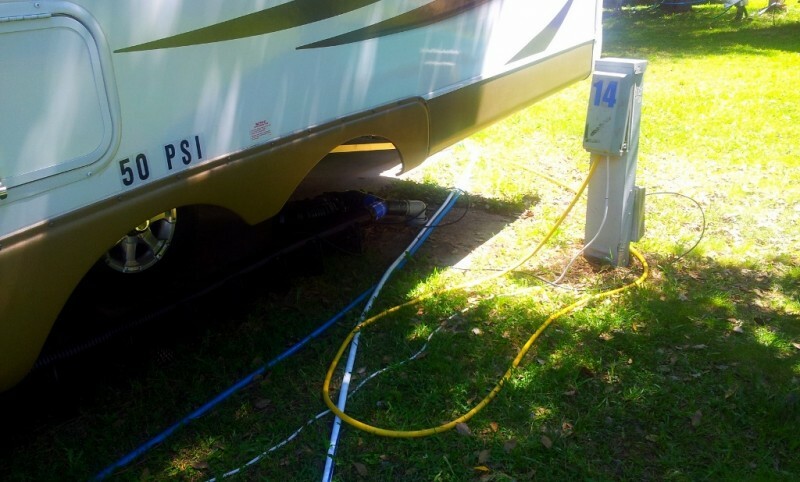 The campground still needs improvement and we'd like to see wi-fi free. Base amenities though are extensive. Nearly new commissary and Navy Exchange. Beautiful golf course and beach with shelters and tables right on base. Great watermark/pool also. K.C. left this review using the Directory software: - Was here prior to this time and was great. However this time the management was different and the place looked unkept. If it rained most of the place flooded. Was unable to get to dumpster without going through a lake. Same with getting to the office. There are only 2 washers and 2 dryers (didn't dry clothes completely). The laundry room has a termite infestation and a lot of the guests complain about but nothing has been done. There are only 4 50 amp sites, some sites are wired for 50 amp but do not have the power yet. (Was told 2yrs ago they would be getting them soon and still only 4) The sites are small and yet you can back a large 42 foot trailer into the spot there is no room to park without parking in the grass (which the tell you not to do). 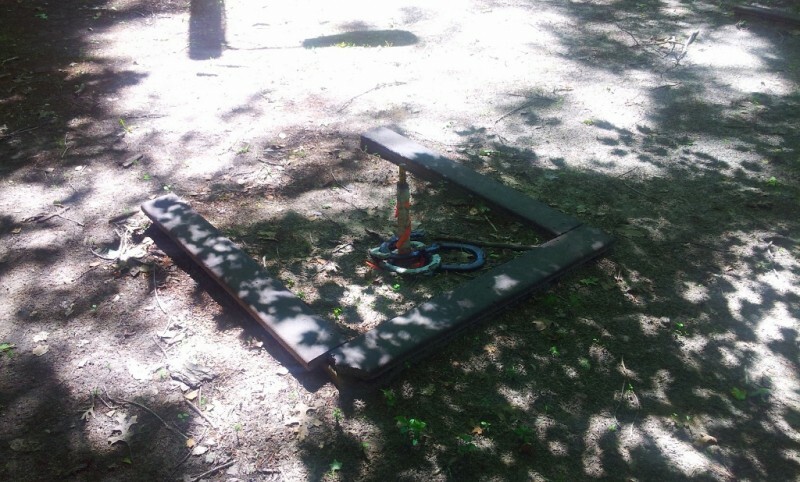 They also removed the playground that used to be there so there is not much for kids to do. 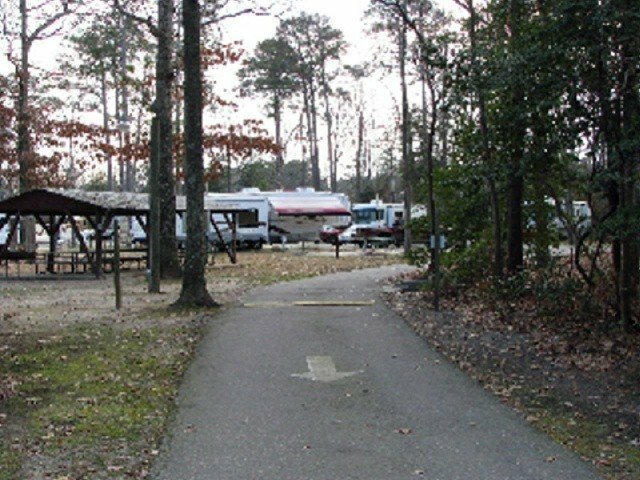 The camp host changes every 3 months so there is no consistency, (the manager has also changed about every 4-6 mo for the past yr.) $22 a night is way over priced for this campground. They should be putting some of this money back into the upkeep of it. For a 1 to 2 night stay it isn't bad but still over priced. This is a great location for everything from the beach to the shopping on and off base. There's a great golf course and beach on base. I have stayed here several times and really like this location. The campground is a little old and could use some upgrades. You have to pay for internet unlike at most facilities where's it's free. It does work well though. The cable TV has never worked. It is all one way roads and for some reason every time I come with my big rig they put me in one of the hardest sites to back in to. The staff is very helpful and accommodating. This is our first stay. We will probably stay here again since it is so close to our daughters place in Virginia Beach. The campground is old and cramped (e.g. narrow roads, tight car parking). 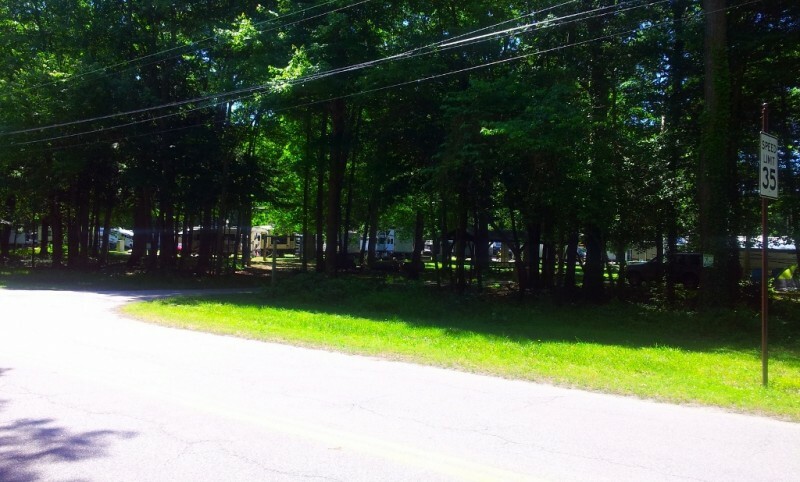 The campground has lots of trees so limited there are only a few sites that where you can get a satellite connection. But they have cable TV which is nice. 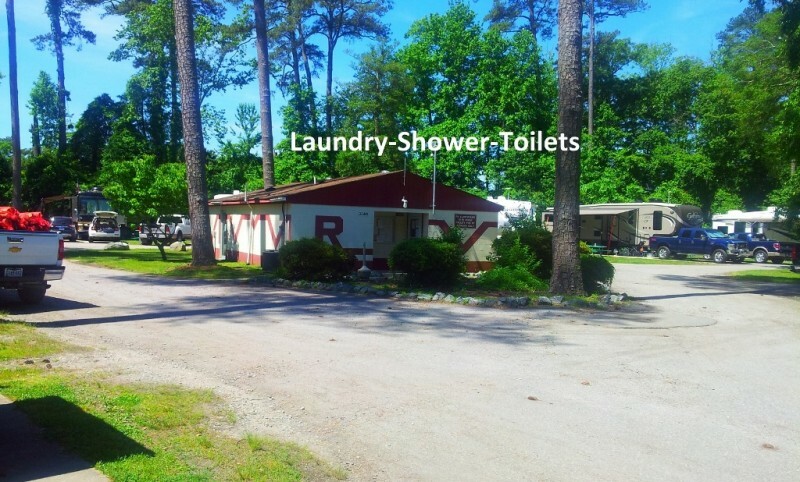 The restrooms are adequate and clean and the laundry facility is good. The campground manager is friendly and helpful. But this is an old park. The grounds are not very well taken care of. The grass has not been mowed since we have been here. Looks like it has been a couple of weeks at least. 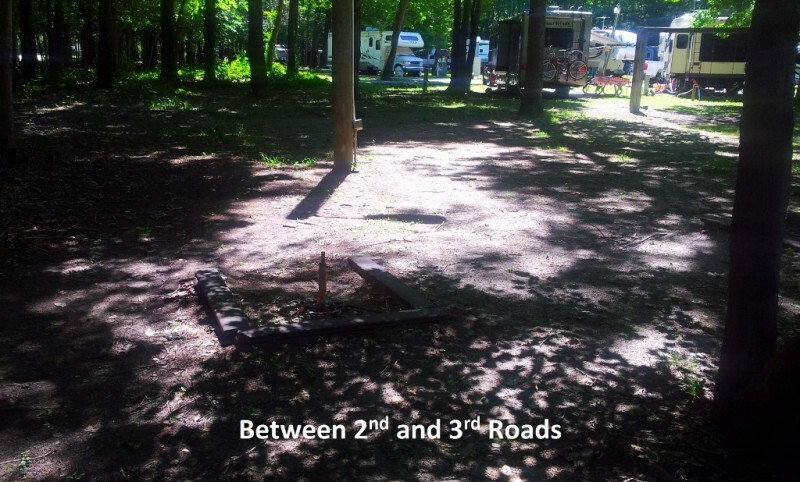 There is a one-way road through the campground but you have to be careful to figure that out when you enter the campground. There are no signs that tell you that. A big problem for us was entering the base. We got Gate 3 correctly, but there was NO indication of which way to go for RV's. There were signs for commercial vehicles. That is the direction we should have take. Hindsight is great but some times areas for commercial vehicles are only for them and not for RV's. Making a split second decision since there were cars behind us, we inched toward the main gate. It was a slow maneuver but we made it past the concrete abutments with out scraping. Very scary. And the gates guards were clueless. No help what so ever. They had no idea what to do with us as we approached the gate. A simple point to the right or waving us through the parking lot where we should have gone would have saved us a lot of trouble. (Can you tell how frustrated I was??) $22 a night for a campground like this is about $7 too much in my opinion. But convenience makes it worth it to us so we will be back. We camped in a 40' motorhome. Diesel now available at renovated gas station. Package store now at new gas station. Large & well stocked. Many sites used as active duty housing. During our 5 day stay some units never showed any activity at all. One sailor took out her own gas powered leaf blower & cleaned up her site. Made a BIG difference in appearance. Entire campground should be beautiful. Instead it looks dingy & dirty. A Billy Goat vacuum would make a world of difference. Different staff person (still part time) seems much nicer, but command needs to change attitude. Golf course is the magnet for us. Very nice & friendly staff.